prepare a better Australian visa application. * We mean everyone! Veazy is suitable for migrants, family, Australian businesses and immigration professionals. Register below to join our waiting list. Coming in 2019. 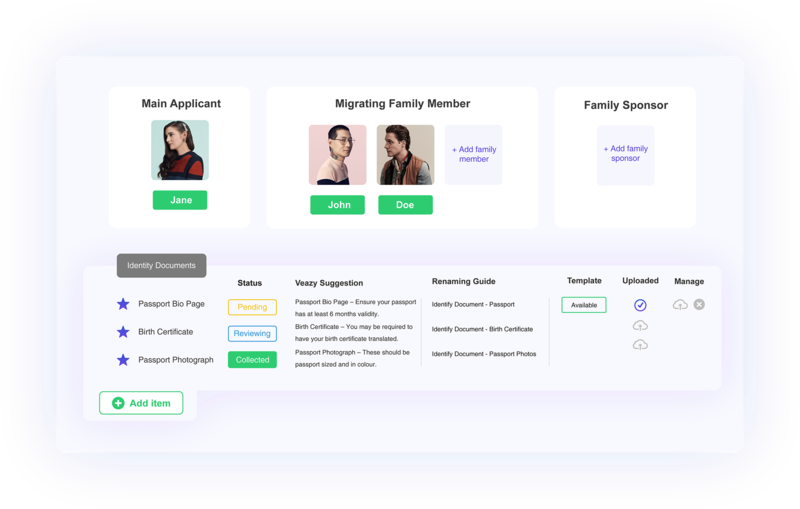 Veazy is an innovative, world first and user friendly online platform that has been developed by immigration lawyers to help you prepare, and manage, Australian visa applications. Suitable for individual, business or industry users. Veazy is flexible yet powerful in the tools and features it delivers. Use Veazy to prepare your own, or a love one's, visa application. Access HD Video lessons, Legal Criteria Summaries, our dynamic Document Checklists, Templates and more! Most importantly, save thousands on legal fees by using our easy to follow system. Does your business sponsor workers? Use Veazy to manage and control all your company Sponsorship and worker Nomination and Visa application. Save employee visa documents in one safe, secure, location and bring the process back in-house. At its core, Veazy is a tool that can be used by any immigration professional to ensure visa applications are beter prepared. Review clients against summarized legal criteria, keep track of client documentation and perform final checks before submitting. Watch HD video lessons to teach you about your visa application. Work through the legal criteria of the application as you preparing it, to ensure that you meet the requirements. Use our system generated interactive checklist to keep track how you are going with collecting the necessary documents. Upload your files to store securely as well as access our legally drafted templates. Go over the Final to Do's as suggested final checks you should complete before you submit your application. Read our FAQ and Answers for more assistance and clarity. If you have a question, chances are someone has asked it before! Read our FAQ and Answers for more assistance of your application. If you have a question, chances are someone has asked it before! Veazy will revolutionize the process of preparing visa applications to Australia. Join us in our journey and register below to be notified when Veazy is ready! Partnership enquiry? Please contact us here.